Postcards are an ideal marketing tool because they are low cost, offer a high return on investment, and save time because they don’t require stuffing. If you’re looking for a postcard with extra marketing real estate, consider creating a folded postcard that provides double or triple the promotional space. In addition to increased space, folded postcards can also qualify for standard postcard mailing rates, providing more value for your money. Extend the life of your mailing and increase its value by including a tear-away business card, coupons, tickets, RSVP card, info request cards, etc. 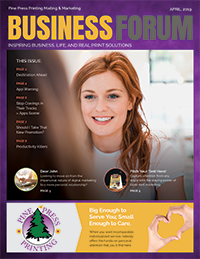 Create a folded postcard newsletter to communicate big business ideas while saving dramatically on design, print, and postage costs. Use them as a tradeshow pre-mailer that grabs attention. Create a convenient tear-away to drop at your booth for a chance to win door prizes or other giveaways. Utilize the valuable extra space to introduce your company to new prospects or announce new products or services. Create a short survey to show customers you value their opinion. Send a coupon to show your appreciation for their business and provide a convenient option to mail the responses or even provide a link to your survey online to increase response rates. Create a folded postcard as a convenient self-mailing thank you card that shows your gratitude, leaving space for a hand-written note inside. If you’d like help creating a folded postcards that you and your recipients are sure to love, stop by or give us a call today! Pine Press Printing & Mailing delivers. Guaranteed!